To be fair, there were not many highlights in favor of the Earthquakes this past Wednesday against the Red Bulls. San Jose gave up five goals. They looked flat, impacted by the heat and humidity, and lacked sharpness, which killed any continuity in their attack. BUT, Vako did make his debut, coming in to start the 2nd half and played the remainder of the match. He did not look completely in sync with the team, but he did show the ability to take defenders one one on one, had deceptive and effective movement, and found himself at the right place at the right time in the 88th minute to redirect a cross from Jahmir Hyka put right in front of goal to score his first goal in his first MLS appearance. Now, the match was already well in control by that point, with the goal making it a 3-1 match in favor of New York, but any time a player can come in and immediately put himself in a dangerous spot AND score, you have to be excited about what the future will hold. Vako put in a solid 45 mins and change, and had the look of a guy capable of starting. International absences have a big impact today. Seattle was already going to be in a weak spot entering this game for one reason or another. Let’s start with Nico Lodeiro, a notable absence for the Sounders tonight, out with a red card suspension stemming from Wednesday’s match against DC. On top of that, the Sounders will be without Jordan Morris and Clint Dempsey as they are with the USMNT in the Gold Cup, and Oniel Fisher has been out with Jamaica. In addition to some untimely injuries for the Sounders, they are going to be hurting for depth tonight. On the opposite end of the spectrum, the Quakes will definitely be without Marco Urena, but they will potentially be getting Anibal Godoy and Darwin Ceren back from their respective national team duties. The takeaway is that the Quakes are getting reinforcements, and the Sounders will be thin. A bounce back day for San Jose. Any time you lose 5-1, there’s no clean way to dress that up as anything but a whooping. Today however, represents a big time opportunity for San Jose to get their first road win under new head coach Chris Leitch, with the potential of reinforcements in the way of Godoy and Ceren, a bench that has grown in depth and quality, and a second showing for Vako. 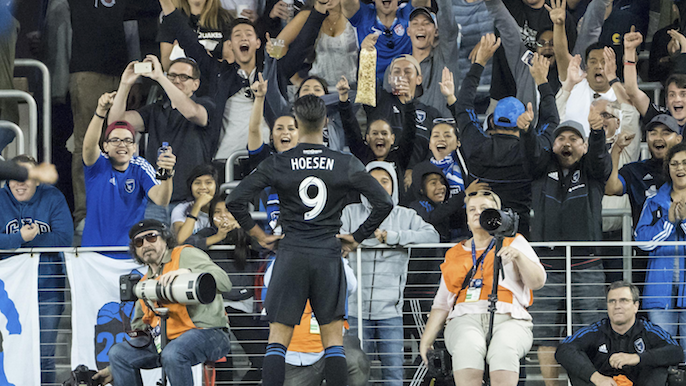 When you combine all the good that is potentially happening for the Quakes today versus the slew of issues the Sounders are dealing with, it seems like a very good opportunity to get a critical three points on the road against a conference rival. The broadcast starts tonight at 730 on KNBR 1050.